Copyright Bilgola Public School, 2012. Bilgola Plateau Public School students, with support from Pittwater Council, undertook an environment audit in 2009 which underpinned the writing of our School Environment Management Plan. Information gathered on waste, power and water was assessed and used as the basis of managing our school environment. The focus in 2009 in the area of water was the total replacement of all schools taps, toilet cisterns and urinals, decreasing our water usage. Teachers and students were strongly encouraged to switch off power when not needed, particularly in high usage areas such as the hall. Class monitors were nominated to turn off fans, lights and interactive whiteboards during break times. The reduction of waste management was encouraged through class fruit breaks, creating a reduction in packaging. All classes were supplied buckets and tongs to collect playground rubbish. Completion of the refurbishment of the K-2 playground was enhanced by planting a number of native plants to attract our wildlife and so increase our biodiversity. Excursions to Macquarie University to use NOVA and ICT to record environment observations which were then linked to our local environment at Avalon sand dunes. A study of Bilgola’s unique environment, including Duffy’s Forest. In 2010 we established a vegetable garden and chicken coop involving parent, teacher and student working bees. Student participation in these projects instilled a sense of ownership, pride and responsibility for their school environment. The school received funding through The Northern Sydney Health Promoting Schools Seeding Grants (funded by Northern Sydney Health Promotion) to initiate our sustainability programs. 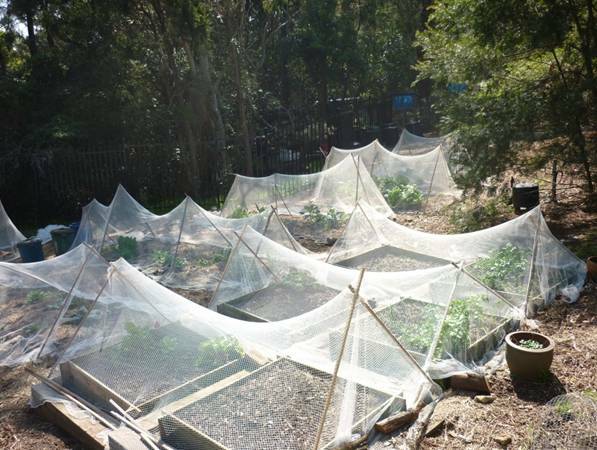 Through a parent working bee we built and established a vegetable garden comprising of six 2mx2m patches and a large meshed area with two coops for our ten very contented chickens. Another ten chickens were purchased this year. We have six compost bins beside the vegetable patch and two worm farms. We have also three ‘no dig’ vegetable patches which are created entirely by recycled paper, mulch, compost and seeds. The vegetable patch successfully grows vegetables, and fruits and herbs which supports our canteen. The funding from the sale of our vegetable produce and eggs goes towards supporting the ongoing maintenance costs of the garden and chickens. New gardens have been planted where the focus is on establishing native gardens to attract our native wildlife and in doing so increase the biodiversity in the school grounds. Year 6 are our ‘Power and Water Rangers’ and are responsible for checking on water and power wastage. They also select a class each week to hand out the Weekly Environment Award. We are hoping next year to install a ‘Smart Water Metre’ to monitor our water usage, detect leaks and be used as a research tool for year 6. Year 4 and 5 students are our ‘Eco Rangers’ and take care of the vegetable garden, the chickens and composting. The students have attended information sessions at the Eco Garden at Kimbriki Tip and have had lessons on both composting, worm farming and vegetable planting. The Pittwater High School farmhand taught them about setting up and caring for the chickens. These students have become experts and have taught other classes in the care of the gardens and chickens. Each week a different class takes responsibility for tending the vegetable garden and caring for the chickens. Year 4 students are also our Green Rangers and are responsible for promoting the ‘Scrap Wrap’ Program. Year 3 is responsible for waste. They promote eradicating litter in the playground and collect fruit scraps from the classrooms after morning ‘fruit break’ to be used for composting. Each class has two green buckets and tongs and students are encouraged to use these to pick up litter. Students in K-2 collect their food scraps for feeding to the chickens, composting or use in the worm farm. In 2011 we introduced our “Grow, Grab, Gobble” program which extends beyond our already established vegetable gardens where every class has a designated vegetable garden patch dedicated to specific fruits, vegetables and herbs. Each class is responsible for preparing the garden bed through mulching, composting and fertilising through our compost bins and worm farms. They will also plant, water, weed and harvest their produce. The selection of crops will be dictated by seasonal planting. Fruit trees will also be planted to support healthy eating knowledge and habits to further support the school’s ‘Crunch and Sip’ Program. Students are encouraged to bring fruit and we are also emphasising vegetables for their ‘Crunch and Sip’ time. We also completed a survey among our Years 3 and 4 students and found that most students through the ‘Crunch and Sip’ program were consuming an average of 4 to 5 glasses of water per day. It is through the ‘Ready, Set, Grow Stage 2’ which the Manly Sea Eagles help to fund, that provided us with the support and resources like gloves, aprons and gardening equipment to further extend our existing produce gardens to enhance the healthy eating programs undertaken in the school. Our main objective is to encourage students to improve their quality of their food consumption with eating not just fruit but also raw vegetables. It is through our vegetable gardens that we are able to teach students about fresh and seasonal produce where the gardens are providing a changed awareness and attitude towards healthy eating choices. This program is also linked to an active P.E. program across the school reducing childhood obesity. The ‘Grow, Grab, Gobble’ program is also linked to our canteen where are working towards selling more of our produce to provide healthy menus for students to purchase. We are already providing eggs for salads and sandwiches, salad produce such as lettuce and tomatoes, pumpkin for soup, watermelon etc. At present we have 20 chickens that are free range through the day. The chickens tie in closely with both the ‘Ready, Set, Grow ’ and ‘Live Well at School’ Programs. Not only do the eggs provide produce for our canteen but the chickens’ provide fertiliser for our garden, reduce waste through eating food scraps, aerate our gardens, eat our pests and unusable garden produce. The students are able to see an active cycle. ‘Harvest Festival Day’: From the produce harvested from their garden each class will be required to research a healthy recipe to prepare and cook for sample tasting for all classes. This will involve parents, students and teachers in both the research and presentation. Every class will prepare their healthy eating samples for all students to taste. After every class has harvested and prepared their samples all recipes from both the research and the sampling will be collated to produce the Bilgola Plateau P.S. “Grow, Grab, Gobble’’ Healthy Eating Cookbook. This will run in conjunction with the ‘Ready, Set, Grow Phase 2 ’ where students are taught about healthy eating choices as well as eating fruit and vegetables that are fresh and in season. This year we converted an area of the school playground that was overgrown with weeds and unusable into an outdoor learning area. Natives are being planted and large rocks placed strategically to attract lizards. There will be mulch tracks, frog ponds and areas with log seating. An old rotunda will be converted into a flight aviary for the rehabilitation of injured birds. Purchase a Smart Water metre to monitor water usage. Apply for grants for water tanks to support our toilet blocks and oval. Apply for grants to establish solar panels and sky lights in all classrooms to reduce energy usage. Constructing a rockery to house lizards. Continue native planting to encourage wildlife. Construct an aboriginal edible ‘bush tucker’ garden. To continue supporting our ‘Scrap Wrap’ program where students avoid bringing food in non-recyclable or re-useable containers. Food scraps are kept separately and are collected for composting or the worm farm thus reducing waste. 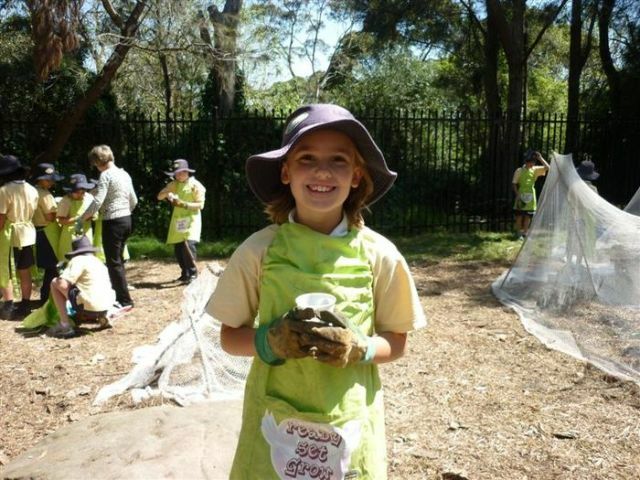 Through this whole-of-school Environmental Sustainability Education project of reducing waste, growing our own local and chemical free produce, promoting biodiversity, and educating and involving the whole school in sustainable practices, Bilgola Plateau Public School is proud of the resulting impact on student, family and community behaviours by becoming an effective sustainable school.